First time cruisers: It's supposed to rain my entire cruise! A reoccurring concern among first time cruisers that book a Royal Caribbean cruise in the warmer months of the year is they see a weather forecast that looks something like this. Does this mean your cruise is ruined? Not so fast. The tropics have two seasons: the dry season and the wet season. 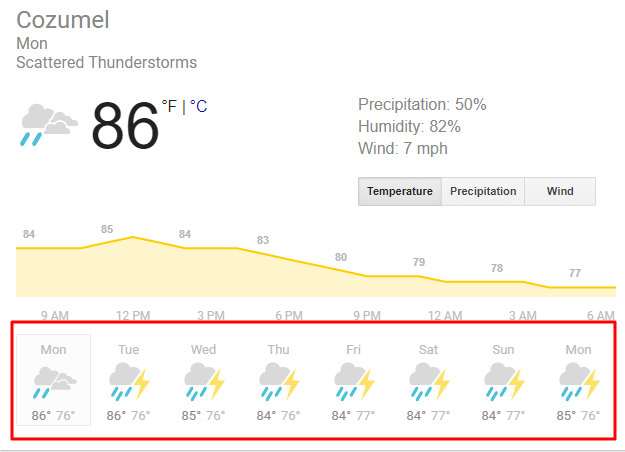 During the summer months in the tropics, it rains every day. This means there is a high chance of rain, but it is not an all day soaker event. Unlike rain storms in the north, where fronts move through and saturate the area with rain for much of the day, rain storms in the tropics are sporadic and short-lived. They pop up during the afternoon, move quickly and have been known to actually rain while still sunny. These sort of afternoon pop up storms are incredibly difficult to predict, so most weather forecasters simply attribute a high percentage chance of rain and hope for the best. Pop up storms are so sporadic that it is too difficult to know exactly where it will rain, so forecasts often look worse than they really are. Despite the fact you see rain in the forecast everyday, it does not mean it will actually rain at all on you, nor will it rain for a long time. This may sound crazy, but ignore the forecast. Rain in the tropics is so common and so unpredictable that it is simply not worth concerning yourself with prior to your trip. Since it is often short-lived, if it does actually rain on you, you can wait it out (with a cocktail in hand) and before you know it, the sun will be back out. On sea days, often the Captain will take routes to follow the sun and avoid clouds so that guests can enjoy the kind of sunny day they dreamed about when booking the cruise. Of course, the Captain can only do so much to help, but if it can be helped, he will do what he can. The exception to all of this are tropical storms (hurricanes), but your Royal Caribbean cruise will not be anywhere near these storms to begin with. Royal Caribbean detours its ships well away from the path of the storm. Read more about First time cruisers: It's supposed to rain my entire cruise! If you have started to plan your first Royal Caribbean cruise, you may have run into a few words or phrases that sounds like something out of a CSI episode, rather than a family vacation. This post will help explain what all these nautical terms mean, so you can learn to "talk the talk" once onboard. Adventure Ocean: Royal Caribbean's children's programming that is open to children between the ages of 3-17. Aft: The back of the ship, which refers to a direction. Bow: The front part of the ship, which refers to the physical part of the ship. Closed-loop sailing: A roundtrip cruise, where the sailing begins and ends at the same port. Cruise Compass: The daily newspaper distributed to guests each day that lists all the activities, events and specials happening onboard the ship. Cruise Director: This officer onboard the ship is in charge of the entertainment during your cruise, from bingo to the shows to trivia and more. Dining package: An optional purchase, where guests can pre-pay the cost of specialty restaurants and receive a discount compared to dining at the same specialty restaurants individually. Disembarkation: Usually refers to the last day of a cruise when you depart the ship at the conclusion of a cruise. Dock: A pier at a port that your ship can pull up to, where guests can walk off the ship and directly onto land. Embarkation: Usually refers to the first day of your cruise when you board the ship. Forward: The front of the ship, which refers to a direction. Friends of Bill W: A code name for Alcoholics Anonymous. Friends of Dorothy: A code name for LGBT activities. Gangway: Ramp guests use to embark or disembark their ship. 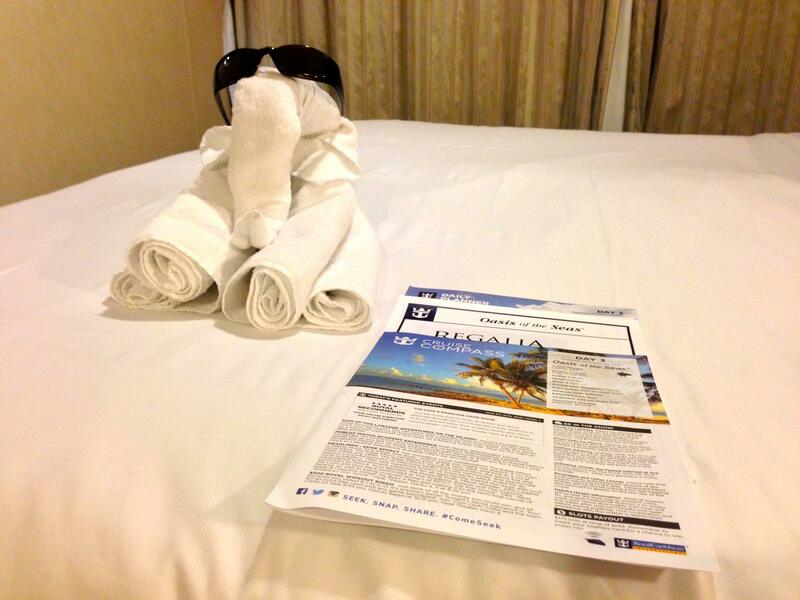 Guarantee room: To help fill in empty staterooms, Royal Caribbean will offer a guarantee room rate. This means you pick a category of stateroom that you are promised you will receive nothing less than that. In fact, you might even be upgraded to something higher. On top of it, you will pay less than someone who picks their stateroom. The "catch" to a guarantee room is that Royal Caribbean will assign your room number at some point between when you book the stateroom and your sail date. You are essentially trading the ability to pick your stateroom location for a lower cruise fare. Itinerary: The day by day list of where your cruise ship is going, with notations for which ports of call you will visit and what times you will be there. MDR: Abbreviation for Main Dining Room. Muster Drill: A mandatory safety event, where all guests report to their evacuation station to learn what to do in case of an emergency. Every guest must attend this event. Muster Station: The designated spot where guests must go in the event of an emergency for evacuation. My Time Dinner: Royal Caribbean's concept for dinner, where guests have flexibility in making reservations ahead of time or simply showing up at any point while dinner is being served. This is an alternative to Traditional Dinner. OBC: Acronym for Onboard credit. Onboard credit is the money in your onboard account that you can use to spend towards purchases made onboard. Open-jaw sailing: A one-way cruise, where the sailing begins and ends in different ports. Porthole: A round window, often smaller than the standard picture window found in most outside cabins. Port/Portside: The left of the ship, which refers to a direction. Repositioning cruise: A one-way itinerary that effectively moves a cruise ship from one part of the world to another. Royal iQ: The smartphone application to manage your cruise while onboard the ship. Only available on select ships. Royal Suite Class: Royal Caribbean's suite offerings available on Oasis and Quantum Class ships only. Sea Day: A day in which your cruise ship does not visit a port of call, and spends the entire day at sea. SeaPass: The card every guest uses to make purchases onboard, identify themselves, and get access to their stateroom. Single supplement: Since cruise fares are based on double occupancy, solo cruisers are charged a single supplement. The single supplement fee is usually 150-200% of the cruise fare. Some Royal Caribbean ships have solo cabins, where the single supplement fee is waived. Specialty restaurant: A dining venue where there is an additional charge to dine there. Usually a cover charge, although sometimes food is charge a la carte. Starboard: The right of the ship, which refers to a direction. 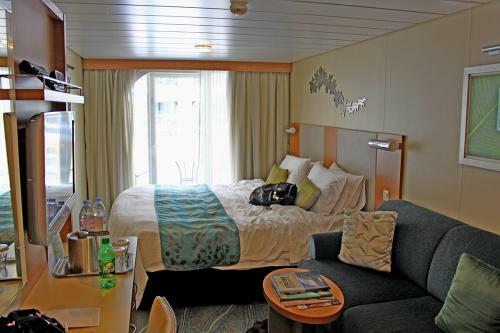 Stateroom: A room for a guest on the cruise ship. Every guest books a stateroom (sometimes referred to as a cabin). Stern: The back part of the ship, which refers to a part of the ship. Tender: A ferry, where your ship will anchor in the harbor near the port and a small vessel will shuttle you between the cruise ship and port. Traditional Dinner: Dinner in the main dining room where you have a choice of either first or second seating (you choose this before your cruise), and are seated at the same table each evening with the same wait staff and table mates. Wake: The trail of waves behind a cruise ship that is created by the ship's engines as the ship moves forward. WOWBand: RFID bracelet that works just like a SeaPass card. When you are onboard a Royal Caribbean cruise, there is a wide array of activities and events taking place every day of your sailing. Any notion of there not being enough to do is quickly dismissed once you take a glance at what is offered onboard. Royal Caribbean's activities staff plan a variety of events to fill your time onboard the ship. These activities are optional for anyone to enjoy, and first time cruisers will find a great deal of options to pick from. From trivia contests to dance lessons, exercise programs to dodge ball games, wine-tasting to surfing, there really is something for everyone. From start to finish, your Royal Caribbean cruise will be filled with different activities to take part in. Each activity is optional. Think of them like a restaurant menu: you only enjoy what you want. Most of the activities listed for guests to enjoy are complimentary, which means there is no additional fee. There are, however, certain events that have an additional cost associated with them. It will be clearly labeled whether an event is complimentary or costs extra. In general, Royal Caribbean tries to offer its guests a wide variety of choices. Having thousands of guests onboard its ships means the staff will try their best to have something for everyone. The exact activities offered will vary from ship to ship, and sailing to sailing. Royal Caribbean does not publish its activities prior to a cruise, but if you learn about the most common activities available onboard, it should provide a good idea of what to expect once onboard. If you are wondering how to find out which events will happen and when, then you will want to consult the daily publication provided each day to guests, known as the Cruise Compass. Each evening, your stateroom attendant will deliver a paper copy of the Cruise Compass to your stateroom. Inside, you will find a list of the next day's activities, shows and entertainment. It also lists the times venues such as restaurants, shops, bars and the spa will be open. There is even a weather report and information about the port you will be visiting. Most importantly, there is a chronological listing of events from the early morning to the late evening. Each event has a time, event name, location and possibly brief description listed. There will also be an indication if this event costs extra. As mentioned earlier, Royal Caribbean does not provide a copy of its Cruise Compass in advance of a cruise, but we keep an archive of past Cruise Compass' on this website, so that you reference them. While a past Cruise Compass will not provide an exact list of events for your cruise, it does serve as a "ballpark overview" of what to expect. On Royal Caribbean ships that offer the Royal iQ smartphone app, a copy of the Cruise Compass can also be referenced there. In fact, the app provides the ability to select events from the Cruise Compass and add them to your own personal calendar. 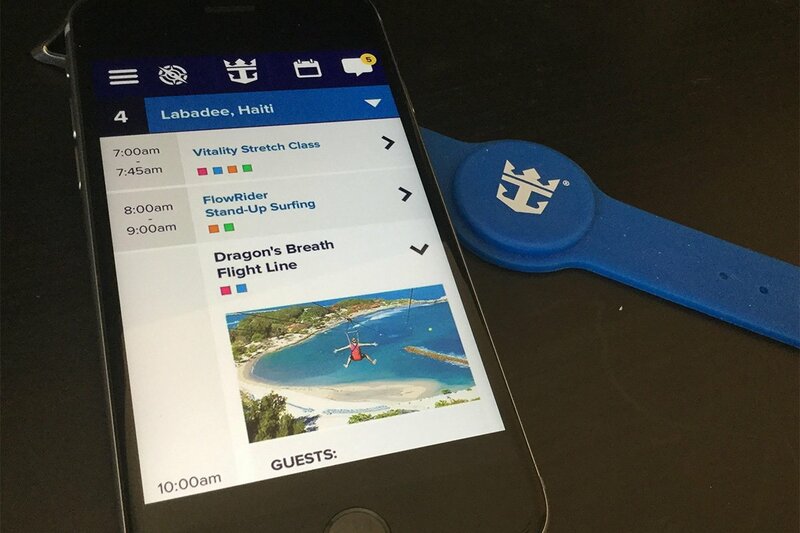 Royal Caribbean also announced that it is working on a new smart phone app, which should debut later this year. Most activities and entertainment on a Royal Caribbean cruise require no reservations or tickets in advance. Guests simply show up at the designated time and location and an activities crew member will be present to coordinate the function. Certain events do offer advance tickets for the performances. Oasis and Quantum class ships will even offer tickets for its theatrical products prior to the cruise, via Royal Caribbean's Cruise Planner website. Tickets are complimentary, and guarantee a seat in the show, but not a specific seat. Royal Caribbean also requires guests with tickets arrive to the show a certain amount of time before show time or risk losing that guarantee. Activities such as exercise classes, wine/liquor tastings, or culinary demonstrations may require and/or offer advanced tickets to secure a spot. The nature of these events are that there is a limit on how many guests may attend. You can certainly show up at the given time and hope for a spot, or speak to a crew member about reserving them. 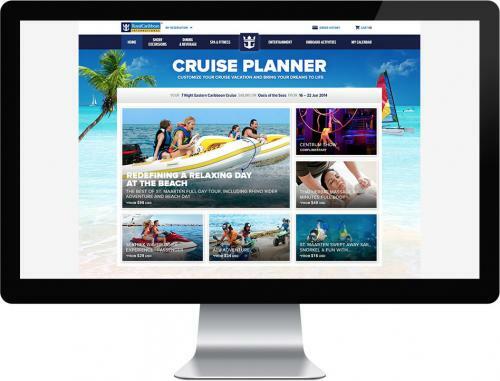 Tickets to certain events are even available online via the Cruise Planner, where guests may purchase the tickets before getting onboard. If tickets are available prior to a cruise for an event, we generally recommend guests take advantage of the option to secure a spot for them. Once onboard the ship, admission to certain events gets quite competitive, so taking advantage of pre-cruise reservations is a good practice. During the daytime, the pool deck tends to be a hub of activity for guests of all ages. Depending on the ship, guests will find a variety of pools and even water slides to enjoy. 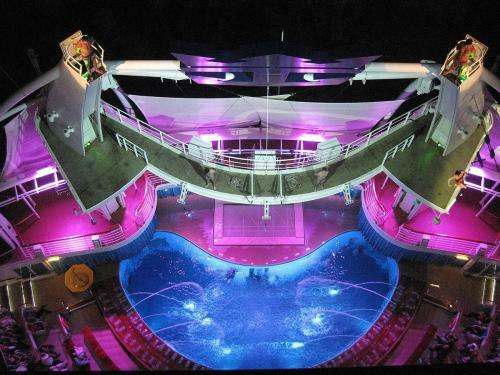 Royal Caribbean designed their pools to be fun, relaxing and most of all refreshing experiences. Whether you are there for the ambiance, the cooling effect or the activities, time at the pool is a great idea. Royal Caribbean's pools are a hub of activity on most cruises. 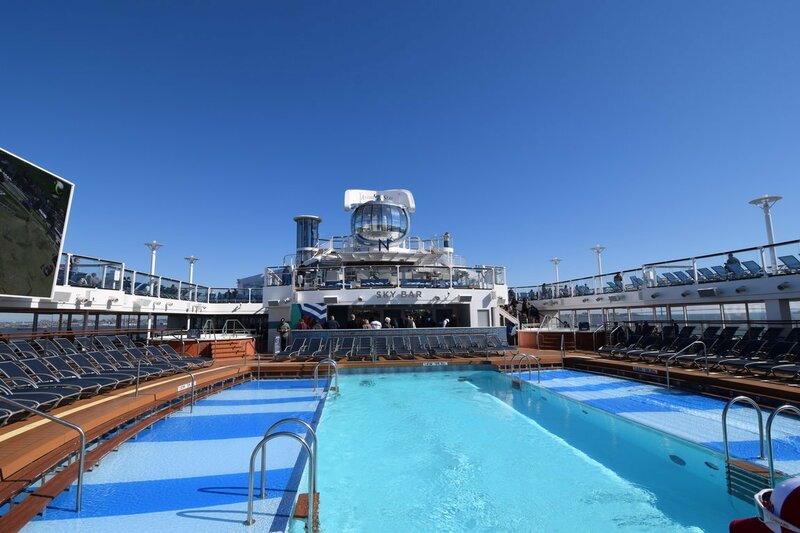 It is where the activity staff will hold many events and you will find by just spending time at the pool, you will encounter a lot of the ship's going-on's. In recent years, Royal Caribbean has begun adding water slides to its cruise ships. Guests of most ages can enjoy the slides, which are complimentary and the kind of activity guests can enjoy as many times as they want. Some other ships feature slides for kids, such as the Radiance Class ships, as well as Majesty of the Seas. One popular onboard activity is staying physically fit while onboard. Whether you love spending time at the gym, or are just looking for a way to work off the delicious food served onboard, Royal Caribbean's fitness center is the right place for you. The fitness center is usually located near the ship's spa, and is open for most hours of the day. Inside the fitness center are a variety of choices, ranging from cardio to strength-training equipment. The equipment in Royal Caribbean's fitness center are complimentary and available on a first-come, first served basis. There is no cost to use the machines and free weights at the fitness center. In fact, Royal Caribbean tends to stock its gyms with top equipment for guest use. In addition, there are spaces for fitness classes, such as spin, yoga, and Pilates. These classes have limited capacity, and there is usually a sign up sheet near the entrance to the fitness center where guests can write down their name and stateroom number for a particular class they want to attend. Guests are charged for each class they attend, so you can attend as few or as many as you like, provided there is space available. The heart of things to do on a Royal Caribbean ship for kids is centered around the Adventure Ocean program. Adventure Ocean is the supervised children's program, which is kind of like camp, where parents drop the kids off and pick them up anytime while Adventure Ocean is in operation. Adventure Ocean is available for children who are at least three years old and fully potty trained, all the way through the age of seventeen. Counselors lead the Adventure Ocean programming while the children are in attendance, and activities are age appropriate. These activities include art, dance parties, games, scavenger hunts, supervised play and more. Adventure Ocean is complimentary, unless your child stays in Adventure Ocean past 10pm, at which point an hourly charge is assessed. Kids may remain in Adventure Ocean until 2am during the after-hours time. Children are split up into groups based on their age. Older children and teenagers will find their own dedicated areas of Adventure Ocean that include lounges and teen-only events listed in the Cruise Compass. During port days, Adventure Ocean will be open as long as the ship is docked in port, allowing parents to leave their children in Adventure Ocean while they enjoy a time on shore. Royal Caribbean publishes a special daily version of the Cruise Compass, just for kids and teens. Your stateroom attendant will deliver a copy of this if there are kids in the room, and it lists Adventure Ocean programming for the coming day. The regular Cruise Compass will also list teens-only events as well. 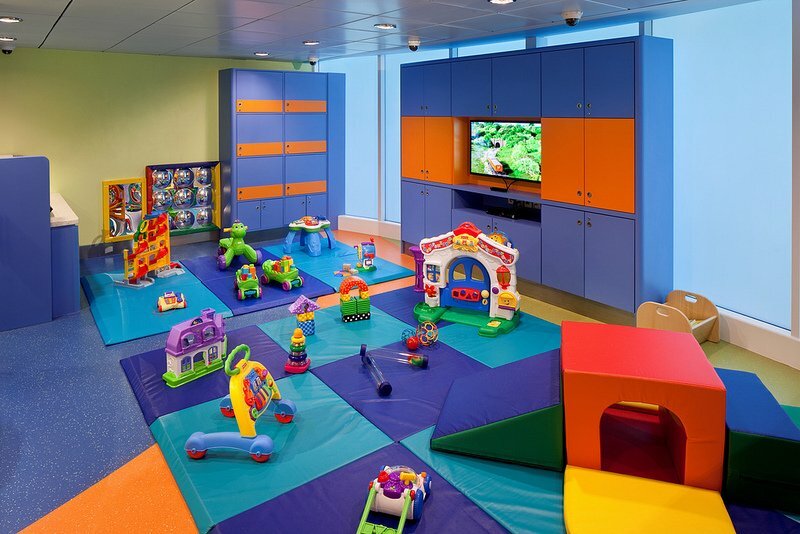 For children younger than three years old, Royal Caribbean's Royal Babies & Tots Nursery offers infants and toddlers supervised care for an hourly charge. The nursery has limited space, and it is recommended to make reservations for the times you wish to bring your child. You can always call the nursery and inquire if there is open space to drop off at the time, but ideally you will want to make reservations. Like Adventure Ocean, the nursery is has set hours, and opens in the morning, going late into the night. If it is a port day, the nursery can open earlier to match the time the ship is in port. Beyond Adventure Ocean, many of the activities listed in the Cruise Compass are open to kids, as well as adults. After the sun sets, Royal Caribbean ships are filled with lots of evening activities. 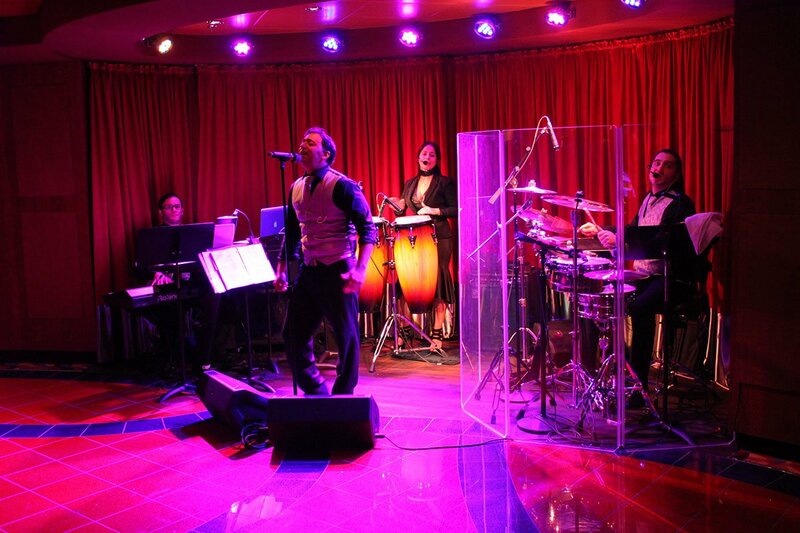 Music is a big part of Royal Caribbean's nightlife. Guests will find live performances around the ship (primarily at bars), along with the opportunity to dance at many of them. Dance parties on deck and in select venues are common as well, with usually a music event lasting well into the early hours of the next morning. Each evening, there will be theatrical performances offered in the Royal Theater, as well as other venues such as Two70, the AquaTheater and/or ice skating rink. Depending your ship, the variety and scope of nighttime entertainment will vary, but there will be something going on each evening that is clearly the primary performance. In addition, there will be alternate times provided for most of these productions, to allow guests time to enjoy dinner without having to sacrifice seeing the show. Royal Caribbean's shows are its signature activity, with some ships even offering full Broadway shows. The shows are included in your cruise fare, and seating is provided on a first-come, first served basis. We recommend arriving to any show at least 15 minutes early to secure a (good) seat. Royal Caribbean will also regularly show feature-length films near the pool, provide sing-along music at the pub, offer karaoke performances, and much more. Are you about to go on your first Royal Caribbean cruise? If you answered yes, then very likely you have a lot of questions. You might have questions about concepts that are completely new to you, or you simply want verification about what to expect. We receive many questions from our readers about their first Royal Caribbean cruise, and here are answers to ten of the most common questions from first time cruisers. How do I get the lowest price for a Royal Caribbean cruise? Everyone wants to save money on their vacation and get the best possible price, so the question most first timers have is how does one get a deal on their Royal Caribbean cruise. If you were to ask veteran cruisers who have taken many Royal Caribbean cruises over the years how they get the lowest prices, they will tell you the key is to book a cruise as early as possible. In general, Royal Caribbean fares are the lowest when sailings first go on sale, and as the ship fills up with guests, prices tend to go up. How early do you need to book? Ideally, booking anywhere from 12-24 months in advance is a great strategy. Not everyone can plan that far ahead, but if you really want to lock in the best possible price, the best strategy is to book early and then re-price the cruise if new promotions come out that lower the price. Check with Royal Caribbean what the rules/laws are that pertain to you and the country you reside in for the ability to re-price a booked cruise. North American residents have the ability to re-book and adjust prices with no penalty up until their final payment date. The other secret to getting the lowest possible price on your cruise is to use a travel agent. Trust us. What time can I arrive to the cruise? When you complete the online check-in for your Royal Caribbean cruise, a boarding time will be assigned to you. However, that time is more of a suggestion than a rule. What that means is you can arrive to the cruise port earlier than the posted time. In most cases, arriving before noon will ensure minimal waits at check-in and during boarding. If you plan on arriving later, keep in mind what time you have to be onboard prior to the sailaway time. Check with Royal Caribbean on the later boarding times, but plan on arriving earlier than that to ensure no delays. When can I start booking shows, drink packages, or shore excursions for my cruise? The simple answer is, it depends. There is no rule that applies to all sailings when these kinds of activities become available for booking. Based on our experience, here are some basic guidelines for when Royal Caribbean usually makes them available for guests to reserve. Generally, they become available around 90 days, although they can show up earlier than that. If you do not see any options available, keep checking back for updates. Can I bring bottled water and/or soda to my cruise? Yes, you may bring small quantities of non-alcoholic beverages in a carry-on or hand luggage onboard only on boarding day. Checking in non-alcoholic beverages will no longer be permitted. Can I bring wine on my cruise? While Royal Caribbean prohibits guests from bringing beer, hard liquor, or fortified wines onboard, wine is allowed. Guests wishing to bring personal wine and champagne onboard may do so only on boarding day, limited to two (2) 750 ml bottles per stateroom. Wine may be consumed in any shipboard restaurant, dining venue, or within the guests' stateroom. Keep in mind that you may be charged a corkage fee for opening your wine in a restaurant, bar or lounge onboard. What drinks and food are included with my cruise fare? Guests will find plenty of complimentary food and drink available throughout the cruise. While there are some food and drink that come with an additional charge, there is lots provided at no additional charge. For breakfast, lunch, dinner and snacking times inbetween, there will often be a variety of options available at different venues. 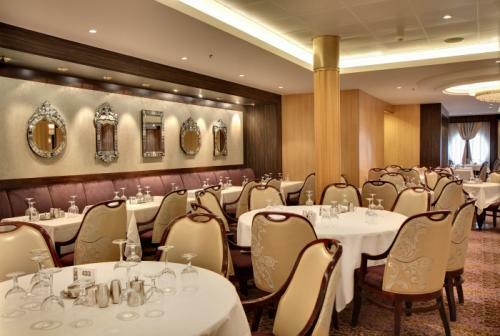 There are dining rooms and buffet options, as well as grab-and-go snacking stations throughout the ship. The Cruise Compass (Royal Caribbean's daily newspaper of events and happenings), will list times and locations for all dining options. In terms of which beverages are included with your Royal Caribbean cruise, Royal Caribbean provides all its guests on all its cruise ships a variety of drinks throughout the day that are included in your cruise fare. These drinks are available throughout your cruise at a number of locations, so there will always be somewhere to get something to drink for free. What is formal night, when is it, and how dressed up do I need to be? Formal night is an evening where the dress code at the main dining room is more upscale. For men, this means collared shirts with nice pants (tie and jacket optional) and for ladies, it is a nice cocktail dress, dress or something else similar. A typical Royal Caribbean 7-night cruise will feature two formal nights, so be sure to pack accordingly. Keep in mind that formal night dress attire only applies to the main dining room and no where else on the ship. The first formal night will usually be on the second night of the sailing, whereas the second formal night can vary between the fifth or sixth nights of a 7-night cruise. Shorter cruises (5-nights or less) will only have one formal night. Cruises 14 nights or longer will have three formal nights. 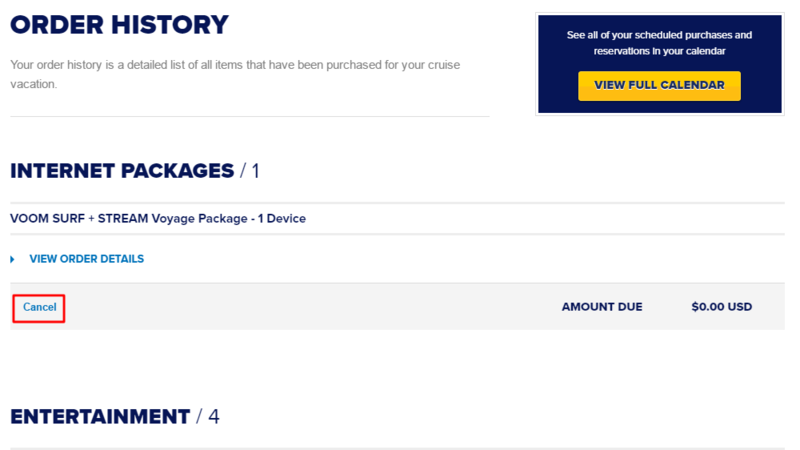 If I buy a drink package, does the other adult in my stateroom also have to buy a drink package? Yes, as of 2018, Royal Caribbean requires if one adult elects to purchase an unlimited alcohol package, all adults in the same stateroom must each buy a drink package. What is the best way to communicate with other guests onboard (like my kids)? Depending on the age of the people you want to stay in contact with and you/their budget, there are a few different options to allow for easy communication onboard. Each stateroom has a phone that can be called from any other stateroom or public phone onboard. If you are trying to reach a guest onboard the ship, you can make a call to their stateroom and optionally leave a message. Use of the phones for calls to a guest's stateroom is complimentary. Of course, it requires the guest to be in the room to answer the call and/or check the voicemail. This can result in "phone tag," where it seems like you are always missing each other. Some guests opt to use their cell phones, although it is important to understand how to use cell phones on a cruise without racking up a very large bill. There are a variety of messaging apps that can be used with a Royal Caribbean internet package. Alternatively, text messaging may be simpler and more economical. There are also some low-tech options, such as walkie-talkies or leaving notes on the stateroom door of the person you are trying to contact. How do I make a dietary restriction/request? Whether you have a dietary restriction or just a special request with your meals, you will want to make dietary requests up front. Royal Caribbean can accommodate dietary needs such as food allergies, gluten-free, Kosher, low-fat, and low-sodium. In additional, vegetarian meals (including Indian-style vegetarian) are available on all menus in the main dining room. Guests do not need to make a special request for these meals. You may also send an e-mail request to special_needs@rccl.com; please include in the e-mail the guests' names, booking number, ship name and sail date. It's best to make requests like this at least 90 days in advance of your sailing. If you forget to make the request in advance, you can always speak to the head waiter in the main dining room. These requests can be for a table or dining rotation change, dietary request or anything else special you want to make certain is covered. Royal Caribbean's Oasis of the Seas is among the cruise line's most popular, and well-known cruise ships. She debuted in 2009 and remains one of the largest cruise ships in the world, with a wealth of activities and entertainment onboard. Frankly, it is a floating destination that offers so much and for someone new to Royal Caribbean, or just new to Oasis of the Seas, there can be a lot to consider. Despite the fact Oasis of the Seas is a rather large cruise ship, it is best to paraphrase Yoda and remember not to judge anything by its size. The ship is large, but believe it or not, very manageable for a first time guest and even more fun. Anyone considering a cruise on Royal Caribbean's Oasis of the Seas will want to consider this planning guide for an optimal first time experience. Let us jump in and get started! Looking at Oasis of the Seas, it is easy to notice how large of a cruise ship she is. When Oasis of the Seas debuted in 2009, she was the largest cruise ship in the world. In the years since, she has been eclipsed barely by her sister ships, Allure of the Seas, Harmony of the Seas and Symphony of the Seas. Despite losing the title of largest in the world, seeing Oasis of the Seas in person will reinforce the notion of how large the ship is. The good news is despite her imposing stature, Royal Caribbean spent a lot of time coming up with a means of making the ship easy to navigate. The last thing the cruise line wanted was to have a cruise ship that is super big and super crowded. 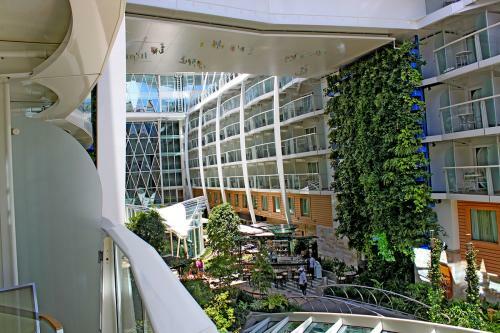 As a result, Royal Caribbean broke up the ship into several themed areas, known as "neighborhoods." These distinct areas of the ship serve as visual cues to where you are and it's important to know about them so you can more easily get to wherever you are going. When talking about size, a common concern is if the ship gets and/or feels crowded. The good news is while it might seem like a ship this size must have crowding issues, Royal Caribbean spent a lot of time working on strategies to make the ship feel quiet. The neighborhoods help with the flow of crowds, and the ship's reservation system integrates tightly with the dining and show management to control crowds. Lines can occur on any cruise ship, but they are rarely awful. A good strategy for getting your bearings on Oasis of the Seas is to walk around and explore the ship as early in the cruise as you can. There is a lot to see and do on Oasis of the Seas, and walking around the ship will quickly provide a good understanding of where things are relative to each other, plus there is a lot of great things to discover. Art, activities, live music, decor and more are found in all the neighborhoods. With the great size of Oasis of the Seas comes a lot of dining choices. Royal Caribbean wanted to ensure there was plenty of options for guests to choose from, as well as a good variety of culinary choices. Guests will find the various eateries onboard fall into one of two categories: complimentary and specialty. A very common concern among new cruisers is how important is specialty dining and how good or bad is the complimentary food. We often hear from readers who are concerned they will be forced to pay for food while onboard their cruise. The fact of the matter is there is plenty of good complimentary food available on Oasis of the Seas. One can easily go their entire cruise and never spend a dime on specialty dining and have a fulfilling and tasty dining experience on Oasis of the Seas. Specialty dining is an option for guests who want something more than what is offered in the complimentary dining, with an emphasis on certain foods that are otherwise unavailable all the time. Think of specialty dining like you would going out for dinner versus staying home and cooking something. You would be perfectly content with a home-cooked meal, but going out for dinner is a nice treat that comes with a higher cost. In short, you do not have to go to any specialty restaurants while on Oasis of the Seas, but we feel it is a good idea to give a couple of specialty restaurants a try. Royal Caribbean put a great deal of emphasis on its specialty dining options and enjoying a specialty restaurant or two will likely not "break the bank," and can really enhance your cruise experience. Most guests spend a majority of their dining time at the Windjammer buffet, main dining room and smaller venues like Park Cafe or Cafe Promenade. Those four options can provide meals throughout the day, and represent the most most popular options with a good variety of food. It is hard to go wrong with any of the specialty dining, but we recommend first timers check out Chops Grille, Sabor and the Izumi Hibachi for great experiences. If you thought there was a lot to dining choices on Oasis of the Seas, wait until you discover all the things to do onboard. 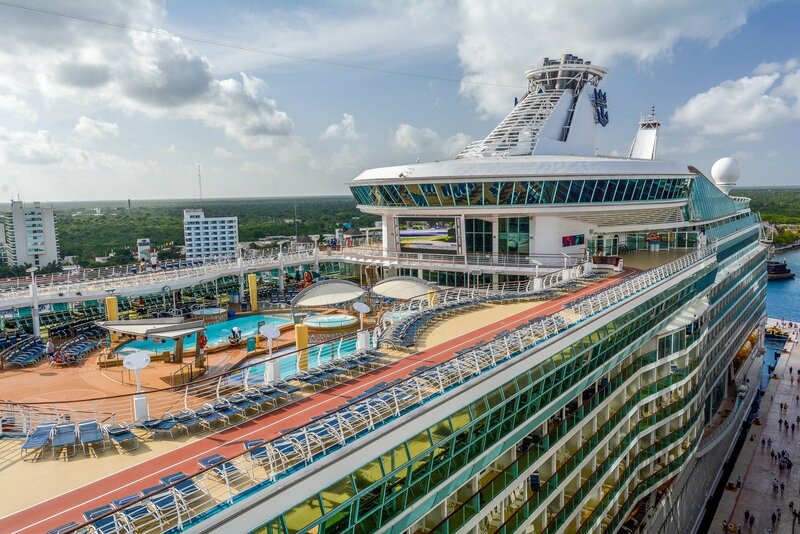 Oasis of the Seas can feel like a floating city with all the activities onboard. The ship bustles with planned events, swimming pools, sports, shows and plenty more. Your guide to knowing what is going on and when is the Cruise Compass. Every Royal Caribbean ship offers a daily Cruise Compass, which is part newspaper and part TV Guide. It documents everything happening during that day, and it is a must-read for any guest onboard. A copy of the Cruise Compass will be delivered to your stateroom each evening by your stateroom attendant. Without a doubt, the premier entertainment on Oasis of the Seas are the shows. Included in your cruise fare are the amazing shows Royal Caribbean has put together that have a New York or Las Vegas feel to them. Even if you aren't "a show person", Royal Caribbean puts on some impressive entertainment that caters to a lot of tastes. You will find Broadway shows, ice skating, water shows and a whole lot more offered onboard and all of these shows are included in your cruise fare. Guests can enjoy one of the greatest Broadway musicals of all time, Cats, in the Royal Theater. This is the full Broadway production, complete with intermission. In addition, the original Royal Caribbean production show, "Come Fly With Me" is also shown in the Royal Theater, along with other headliner acts. In the Studio B ice rink, guests will find the ice skating performance of, "Frozen in Time." The outdoor Aqua Theater features the dining show, "Oasis of Dreams." When planning your cruise, be sure to carve out time for these shows. The performances in the Royal Theater and AquaTheater are must-see events, and the ice skating show is very good as well. Considering there is no additional cost to see these shows, you will want to check them out because Royal Caribbean has put a lot of energy and talent into the performances. One important tip if you are new to cruising is on Oasis class ships you can book your entertainment in advance from the comfort of home. The Pool and Sports Zone is the area of the ship with plenty of outdoor space and a good variety of pools and swimming options. Oasis of the Seas has 4 separate pool areas. All pools are located on Deck 15 and are salt water. Solarium: Adults only (age 16 and over) pool area with two cantilevered whirlpool hot tubs, which extend 12 feet from either side of the ship. Sports pool: area for playing pool games such as synchronized swimming and volleyball. The sports pools area may have designated times for swimming laps. H2O Zone: interactive kids aqua park, where kids and their families can enjoy geysers, sculpted fountains, and waterfalls. For parents with young children that are still wearing diapers, there is a designated baby and infant splash pool, designed specially for them. Children wearing diapers are not allowed in any other pools. Unless otherwise posted, there will always be pool and whirlpool hot tubs open 24 hours a day. Pools will be closed occasionally when they need to be cleaned as well if weather or sea conditions make the pools unsafe for swimming. The pools tend to also be a hub of activities, with lots of events held in or around them during the day. In fact, during the day, a vast majority of events happen in the pool area. Royal Caribbean is a huge proponent of live music and you can often enjoy bands playing music at the main pool throughout the day. These bands will play reggae, classic rock and even contemporary hits. For fans of live music, sitting by the pool and enjoying music is perfect. Oasis of the Seas was designed with impressive onboard activities, including a few things to do that are unique to Royal Caribbean. Oasis of the Seas has plenty of traditional cruise activities, such as bingo, trivia, demonstrations and more, but the ship is known for some noticeable activities that are as fun as they are intriguing to watch. Plus, they are complimentary to enjoy. Choosing your stateroom for Oasis of the Seas involves a lot of choices. There are traditional cabins categories, as well as a few new categories that blend categories together. Depending on your budget, family size and preferences, there are quite a few options to consider. Like all Royal Caribbean cruise ships, Oasis of the Seas cabins fall into four distinct categories. When you hear about a stateroom with a balcony, you are probably envisioning a view of the ocean but Oasis of the Seas introduced cabins that have balconies that overlook two of their most popular neighborhoods: Central Park and the Boardwalk. Both offer great views of their respective areas and they can be just as fun as an ocean balcony given the beautifully decorated areas. Complimentary meal for four at Johnny Rockets. Complimentary Royal Refreshment soda package for two guests. Exclusive rock climbing wall experience for the entire family. Complimentary lunch for two at Giovanni's Table. Complimentary bottle of red wine in your stateroom. Private casino gaming lessons from an onboard expert. One common question about these balconies is noise, since other passengers will be who you can see and hear from your balcony. Generally speaking the noise factor is not a consideration and we would recommend trying either type of neighborhood stateroom. Among the different suites available are loft suites, which are an Oasis class option that come with two floors of living space, in addition to a large balcony. If you are bringing kids with you on your Oasis of the Seas cruise, they will have lots to do onboard. Royal Caribbean re-invented its award-winning Adventure Ocean program to offer one of the largest kids areas at sea. Tweens and teenagers also have their own club, plus a variety of activities onboard such as the FlowRider surf simulator, rock climbing walls, an ice skating rink, a mini-golf course and a zip line. Teens meet at the Living Room, on Deck 15 aft and also have exclusive access to their own night club, known as Fuel on deck 15. Teens are free to come and go as they want, and curfew for all cruisers younger than 18 is 1 a.m. unless they're supervised by a parent. Royal Caribbean offers daily programming for teens, with their choice of as little or as much as they want to do. This includes things like teens-only FlowRider time, speed climbing on the rock wall, prom night, glow in the dark party, teens-only ice skating and more. When it is time to get onboard Oasis of the Seas, be prepared for the start of an amazing vacation experience. If you are feeling a bit overwhelmed with what to do on your first day, here are some good ideas for tackling day one on Oasis of the Seas. If you read the Royal Caribbean documentation, there is a fairly large window of time you can arrive to the ship, but ideally plan to arrive early to check-in. Your best bet is to arrive before noon for check-in. If you can, try for check-in in the 10:00am hour, to ensure you are among the first to board the ship. Once onboard, grab something to eat before everyone else has the same thought. The Windjammer buffet will offer the most variety, but it can easily get crowded there. If you board Oasis of the Seas early, crowds will not be an issue, but if you find lines, consider alternative options that have great food without the lines. Park Cafe in Central Park and Wipe Out Cafe on Deck 15 are great choices. If you do not mind spending some money, Sabor and Giovanni's Table are open for lunch and will ensure a very tasty start to your cruise vacation. With food in your belly, if your staterooms are not open yet, take the opportunity to start walking the ship. Oasis of the Seas is a large ship, and there is lots to see, so walk around to get an idea of where things are located. Exploring Central Park, the Boardwalk or the pool decks area great starting points. Do not force yourself to try to "see it all" on day one. You do not want to burn yourself out with running around the ship on day one, so focus on areas that appeal to you and branch out from there. On most sailings, your staterooms will open at 1pm, which is an opportunity to drop off any belongings you brought with you in your carry-on items. It is also the first chance to check out your home for the duration of your cruise. While in your room, check to see everything is operating correctly and that you can operate the in-room safe, as this is your dedicated spot to store valuables and you want to make sure this is working correctly and you know how to operate it. If anything is not working, or you are unsure how to operate something, contact housekeeping or maintenance immediately to have it taken care of quickly. Did you know the pools, FlowRider and H2O Zone are open on embarkation day? Take advantage of the low crowds in these areas by going for a swim. After a long morning of getting to this point, a dip in the pool can be a great idea. By far the least crowded time at the pool will be embarkation day because most guests have their swimsuits in their luggage, which is in the process of being delivered to their staterooms. If you bring your swim suits with you (or wear them before you get onboard), then head to the pool and enjoy uncrowded pool time. If you have not made dining reservations prior to your cruise, your first day is the best time to make a reservation onboard. Popular days, like formal nights and holidays, will see specialty restaurants book up quickly, so if you are interested in dining at any of them, make your reservations sooner than later. Guest Services typically has lines on embarkation day, so instead, you can go to any specialty restaurant and make reservations for that and any other specialty restaurant. Their booking systems are linked, and that means no need to go to each restaurant individually (unless you want to). A very common choice is the sailaway party, which is usually held at the pool deck. There will be music, dancing and a whole lot of celebrating with the ship's activities staff. If you want something quieter, consider finding a spot near a railing that overlooks the port area. A hidden spot for sailaway are the wing viewing areas, located on deck 14 near the Solarium. If you are staying in a stateroom that has a private balcony, it is hard to beat that kind of a spot for sailaway. Grab some drinks from the bar and bring it down to your stateroom to enjoy on the balcony. After all, having a balcony stateroom means you do not have to compete with anyone for a spot (except perhaps your kids).